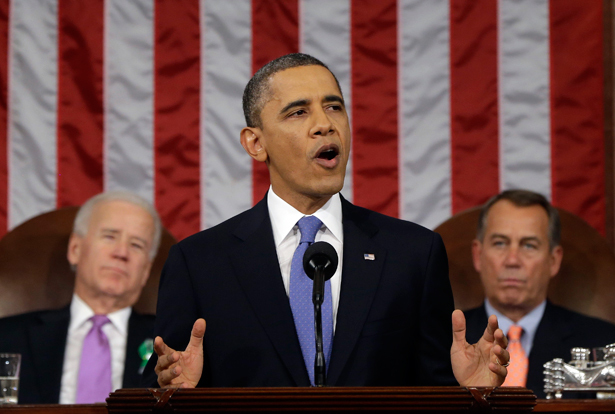 Highlights from The Nation's coverage of the State of the Union Address. During his State of the Union Address this week, President Obama put forth a bold call for jobs and growth, including a proposal to raise the federal minimum wage to nine dollars an hour. Although progressives should push for a living wage that exceeds the president’s proposal, his leadership on the issue offers a starting point for people to organize around in states and communities. On PBS’s NewsHour on Wednesday, I talked about why raising the minimum wage is so vital to those living in poverty in the United States—and how reducing inequality is the only way forward to get our economy on track. “We need to look at and understand that inequality is perhaps the greatest threat to economic recovery and democracy, and in that context we must take action,” I argue. But aside from a clear rejection of austerity and a push to strengthen the middle class, the president also called on Congress to prioritize immigration reform and gun control. “Obama’s determination to devote so substantial a portion of his State of the Union Address to the gun debate that is still in formation, and his willingness to make specific and repeated demands for House and Senate votes, provided another indication that he will not let this issue go,” writes Washington Correspondent John Nichols. The president spoke powerfully about Hadiya Pendleton, the 15-year-old who was shot and killed in Chicago just three weeks after singing at his inauguration. “Hadiya’s parents, Nate and Cleo, are in this chamber tonight, along with two dozen Americans whose lives have been torn apart by gun violence,” said the president. “They deserve a vote.” As Nichols writes, Obama’s emotional call signals his commitment to taking action on gun violence, and his repeated statement, “they deserve a vote,” forcefully condemns the obstructionism that dominates Congress. As for the Republican response, Marco Rubio’s rebuttal to the president was, if nothing else, “remarkable for being unremarkable,” as George Zornick observes. And the only substantive part of the speech was an attack that was riddled with lies about the Affordable Care Act. Zornick fact checks Rubio’s claims and reveals how he’s “explicitly trying to scare people into thinking they’re about to either lose their health insurance or get fired because of Obamacare. But none of this is true.” Take a look at Zornick’s full analysis of Rubio’s rebuttal—and how he failed to make the case that Obamacare is hurting middle-class Americans. Also, as I told ABC News’s The Note on Friday, while Rubio’s water moment dominated coverage of his speech, what we should really be focusing on is his opposition to the Violence Against Women Act. For more analysis on the State of the Union Address and what this means for our economy, infrastructure and future, listen to my conversation with Brian Lehrer on WNYC this week. And check back to The Nation as we continue to assess the president’s priorities. The only thing Marco Rubio proved with his rebuttal to the State of the Union was that he is not ready for prime time, Katrina vanden Heuvel tells ABC.